I am a Post-Doctoral Associate in the Social Media Lab at Cornell University where I work on new design interventions for cyberbullying and study the effects of robotics on team collaboration. 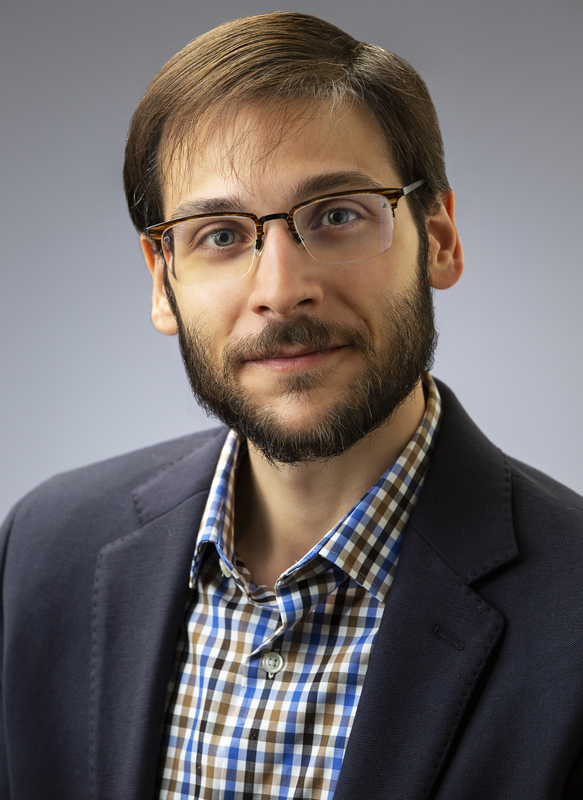 My research involves collaborating with colleagues across the social sciences and humanities to translate the tools and methods from data science, e-science and informatics to address their research needs and purposes. This includes working with a wide array of research groups and projects including large-scale social network analysis, experimental ethnography, open government data, and web observatories. I hold a PhD in Computer Science from the Rensselaer Polytechnic Institute and was a member of the Tetherless World Constellation. 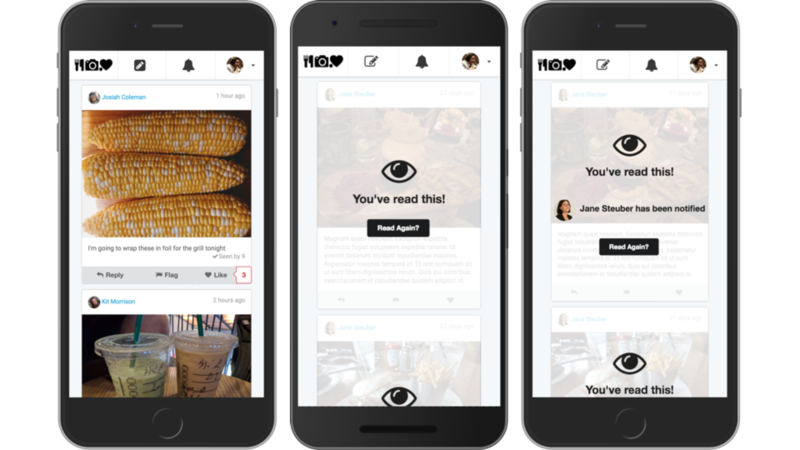 Truman is a complete social media simulation platform for experimental research. It creates a custom social media site where every user, post, like, reply, notification, and interaction can be created, curated and controlled by the research team. 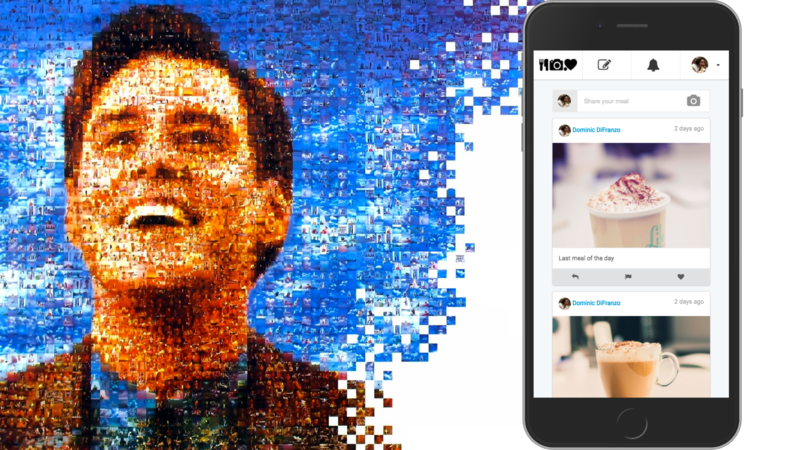 This social media simulation platform (named Truman after the 1998 film, The Truman Show) can create a controlled social media experience for participants. In this way, each participant is completely "alone" in this social media site, as every user they interact with is an actor being played by a "bot". 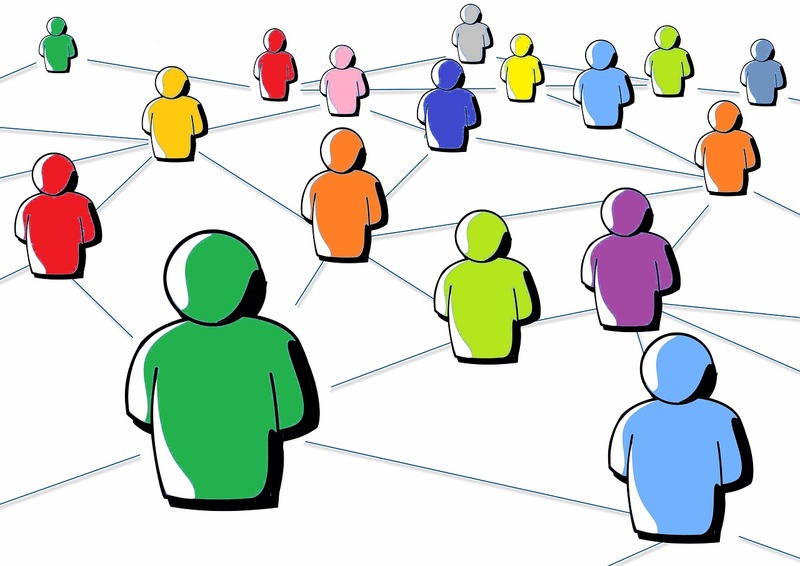 This allows for complete control of the social situations and actions that take place on the platform, as every participant experiences the exact same social media experience. The Truman platform also allows for complete replication of any study as all the code, data, and media necessary to run this social media simulation is freely available on a public GitHub repository. Truman is an open source platform that is freely available for other researchers to use and build upon for their own studies. 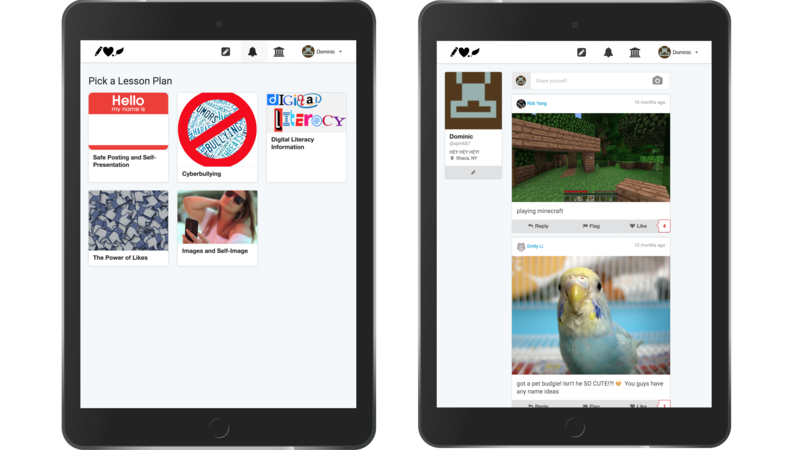 Social Media TestDrive is a educational platform that lets kids practice being online while ensuring their mistakes won’t come back to haunt them, online or off. The training simulation (built off the Truman Platform) includes a number of lesson plans to teach social media skills to kids. Although bystander intervention can mitigate the negative effects of cyberbullying, few bystanders ever attempt to intervene. In this study, we explored the effects of interface design on bystander intervention using a simulated custom-made social media platform. Participants took part in a three-day, in-situ experiment, in which they were exposed to several cyberbullying incidents. Depending on the experimental condition, they received different information about the audience size and viewing notifications intended to increase a sense of personal responsibility in bystanders. Results indicated that bystanders were more likely to intervene indirectly than directly, and information about the audience size and viewership increased the likelihood of flagging cyberbullying posts through serial mediation of public surveillance, accountability, and personal responsibility. The study has implications for understanding bystander effect in cyberbullying, and how to develop design solutions to encourage bystander intervention in social media. This research aims to explore whether robots can shape interpersonal dynamics between people through simple task-related behavior. Autonomous robots are increasingly used to support work in groups and teams but it is unclear how a robot's behavior shapes the way people perceive and interact with each other. The proposed will examine a robot assisted assembly setting in which a robot delivers parts to two or more humans working on an assembly task. 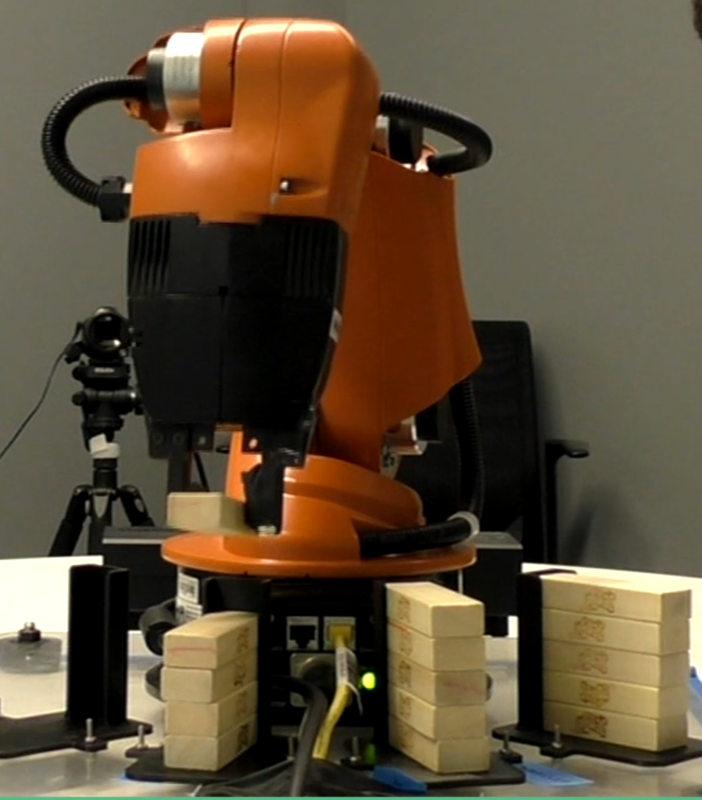 By systematically varying the ways in which the robot delivers the parts we seek to gain understanding how the robot's behavior influences interaction dynamics between group members. 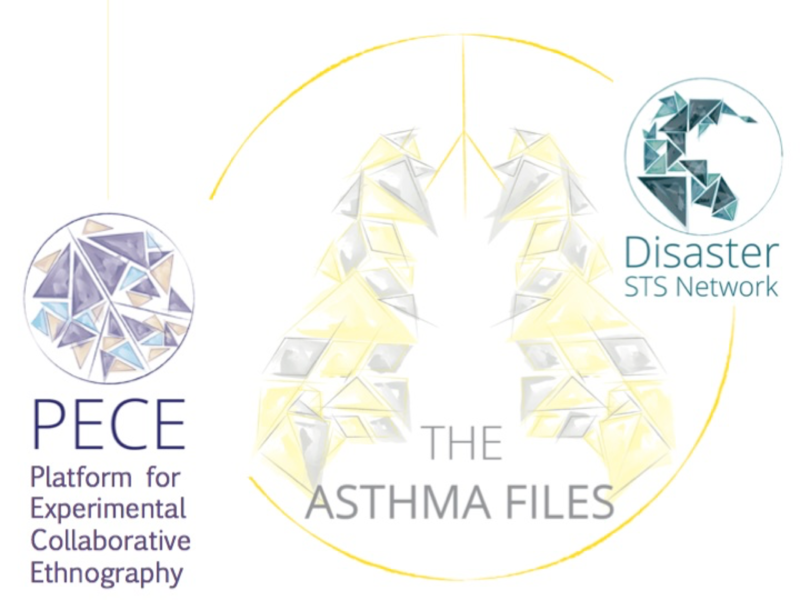 The Platform for Experimental, Collaborative Ethnography (PECE: pronounced “peace”) is an open source (Drupal-based) digital platform that supports multi-sited, cross-scale ethnographic and historical research. The platform links researchers in new ways, enables new kinds of analyses and data visualization, and activates researchers’ engagement with public problems and diverse audiences. PECE is at the center of a research project that explores how digital infrastructure can be designed to support collaborative hermeneutics. My thesis explored new design methodologies to help work with scholars in the empirical humanities and science and technology studies to build PECE. As part of the EPSRC funded project SOCIAM, I built a real-time data visualization that combined traditional polling data with social media posts for the 2016 UK and US Elections. The application was built and designed for the Rensselaer Polytechnic Institute EMPAC Campfire, a novel multi-user, collaborative, immersive, computing interface that consist of a desk height panoramic screen and floor projection that users gather around and look into. 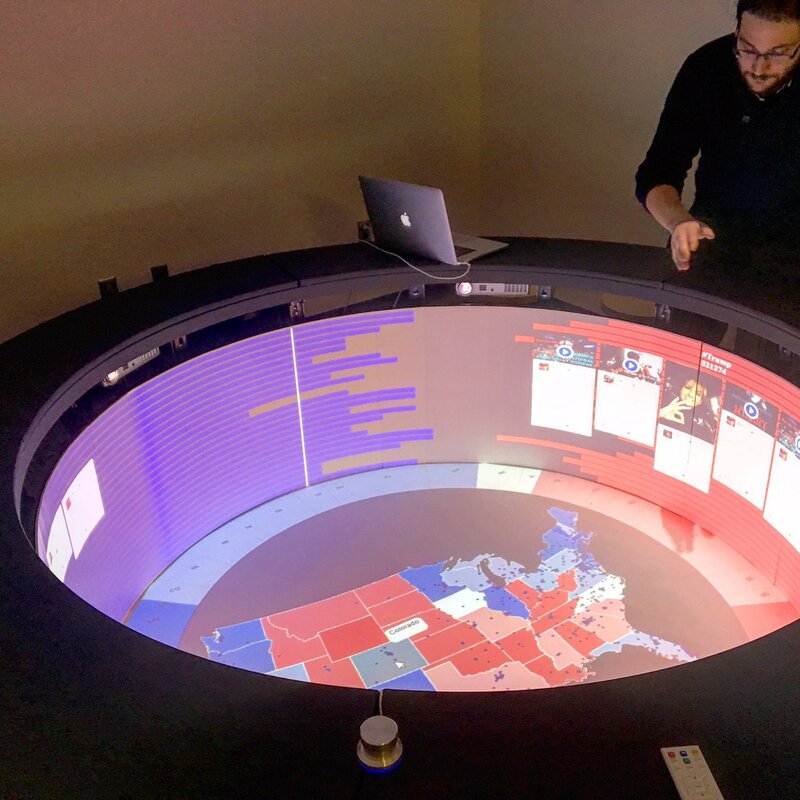 This visualization system allows groups of users, in real time, explore the local social media conversations taking place about the elections, while also exploring the historical polling and option data. Mental health disorders, such as anxiety and depression, are common, affecting a quarter of the US population (26.4%), often with onset in adolescence. Though prevalence rates are similar, those living in rural areas are less likely to receive mental health treatment than urban dwellers. Technologically-mediated crisis supports, such as Crisis Text Line (CTL), may complement face-to-face therapeutic interventions by supplementing limited, existing local resources. This interactive map shows usage of CTL in NYS from 2013 – 2017. The multi-disciplinary nature of Web Science and the large size and diversity of data collected and studied by its practitioners has inspired a new type of Web resource known as the Web Observatory. Web observatories are platforms that enable researchers to collect, analyze and share data about the Web and to share tools for Web research. 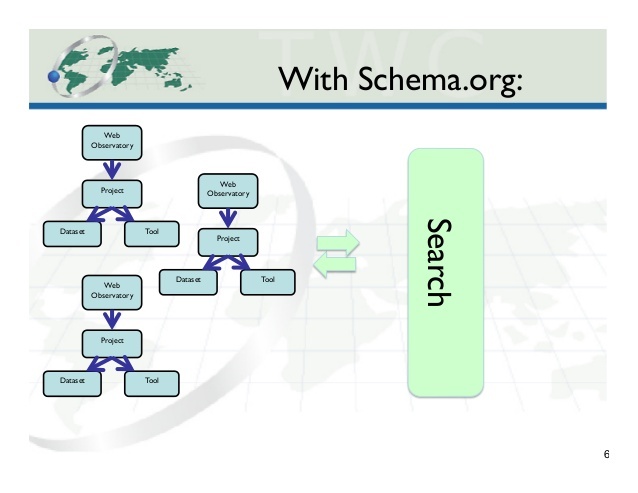 In this effort, I helped to create a semantic model for describing Web Observatories as an extension to the schema.org microdata vocabulary collection. 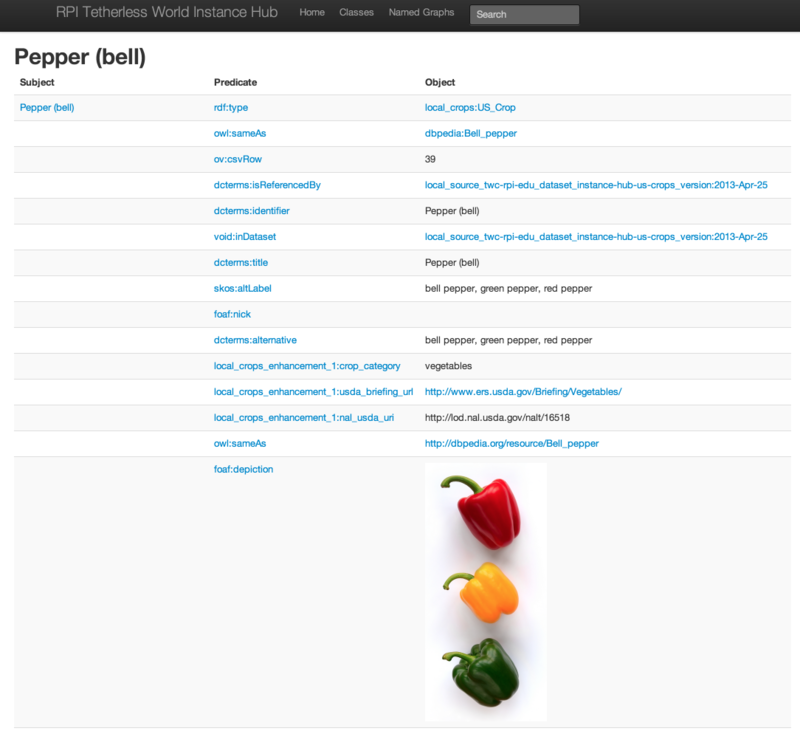 This model helps enables Web Observatory curators to better expose and explain their individual Web Observatories to others, thereby enabling better collaboration between researchers across the Web Science community. Virtual worlds present a natural test bed to observe and study the social behaviors of people at a large scale. Analyzing the rich "big data" generated by the activities of players in a virtual world enables us to better understand the online society, to validate and propose sociological theories, and to provide insights of how people behave in the real world. However, how to better store and analyze such complex big data has always been an issue that prevents in-depth analyses. In this work we explored how how Semantic Web technologies to address these issues, and explained certain social concepts expressed within a massively multiplayer online game, EverQuest II. 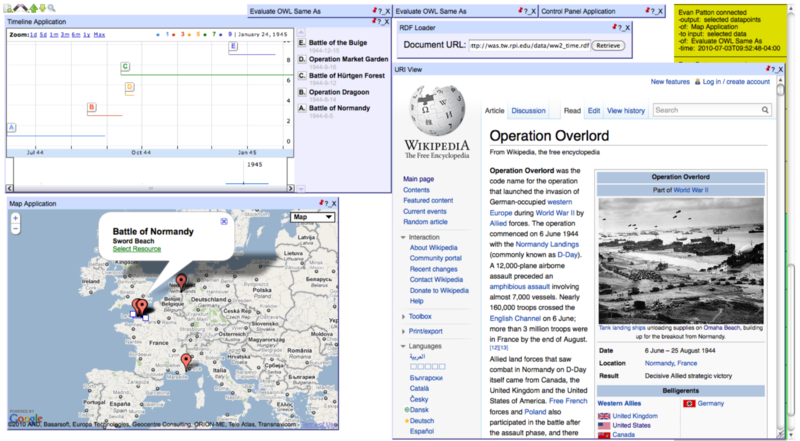 On the Semantic Web there is a need for ways to express authoritative references to entities, and to do so in such a way that is descriptive of those entities both for computers and humans. The Instance Hub provides a way of doing this for collections of entities in related categories, e.g. : countries, US states, US government agencies, crops, toxic chemicals, etc. A URI (uniform resource identifier) is a string of characters that identifies a name or a resource on the web (ie:http://logd.tw.rpi.edu/id/us/state/New_York). The Instance Hub creates URI standards for common concepts in open government data, and creates a interface to search and display them. Users can logically navigate the hierarchy of URIs in the Instance Hub, viewing categorical information at varying levels of specificity. The LOGD project investigates the role of Semantic Web technologies, especially Linked Data, in producing, enhancing and utilizing government data published on Data.gov and other websites. A large portion of government data published on the Web are not necessarily ready for reuse. The Tetherless World Constellation (TWC) has publishing over 8 billions RDF triples converted from hundreds of government-related datasets from Data.gov and other sources (e.g. 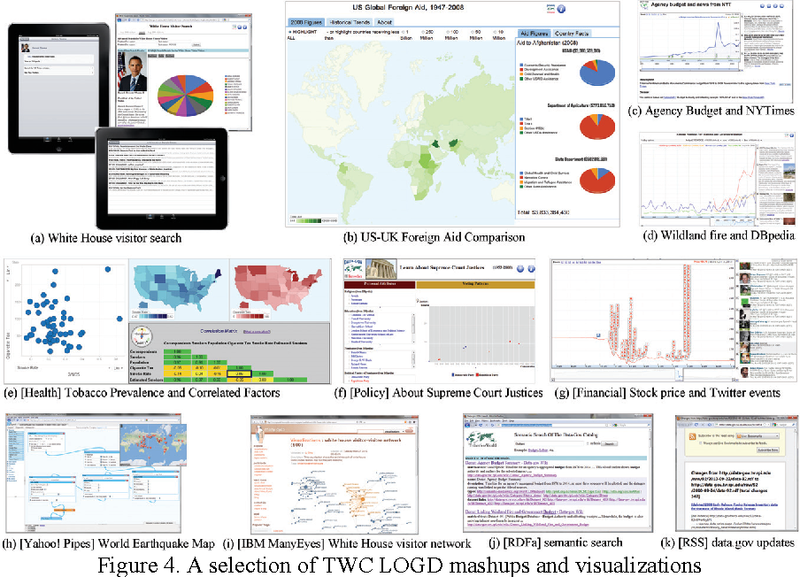 financial data, non-US government data) covering a wide range of topics (e.g. government spending, energy usage and public healthcare). This work also explores interlining data and building mashups using popular Web tools and APIs. Data and Mashup Visualizations from this project have been featured on Data.gov and WhiteHouse.gov.